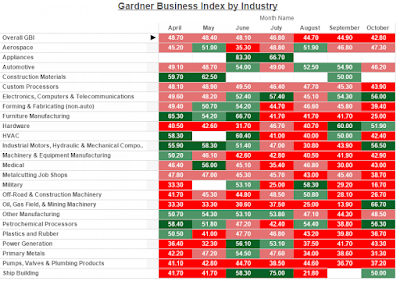 I have an interesting update from Steve Kline Jr., Director of Market Intelligence at Gardner Business Media, Inc., a B2B media company that conducts surveys similar to the ISM. 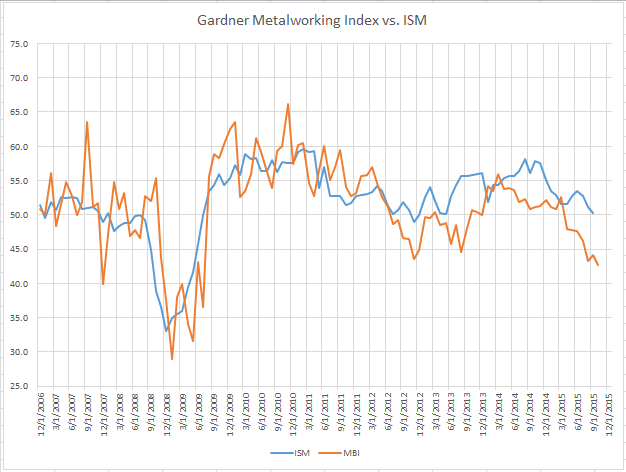 For a description of Gardner Business Media, please see Alternative ISM for Metalworking, Plastics, Composites Suggests Economic Contraction. 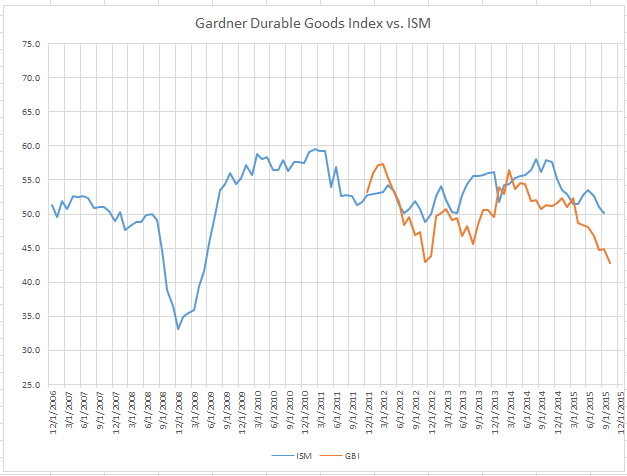 I wanted to give you an update on the comparison between the Gardner Business Index and the ISM. I included the initial portion of our data for October even though we only have about 60% of the responses we should get by the end of the month. So far in October the index has dropped with small companies getting worse and big companies doing better. 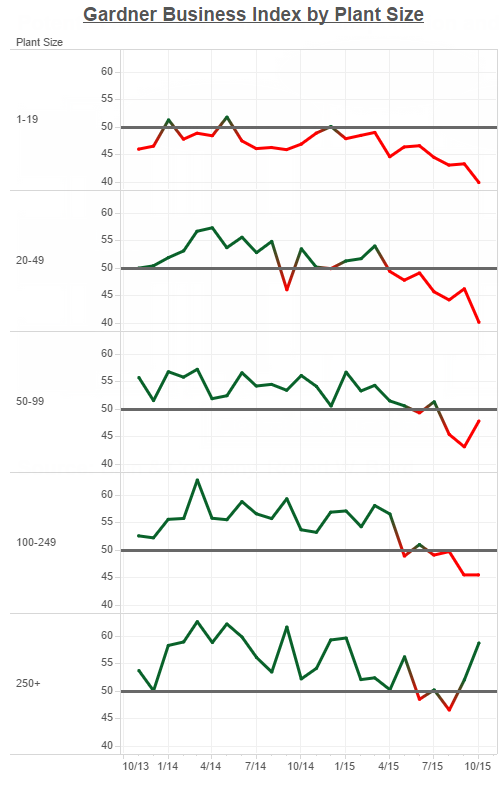 In the Excel file, I included an additional chart that compares the ISM to our index for companies with more than 250 employees and companies with 1-19 employees. 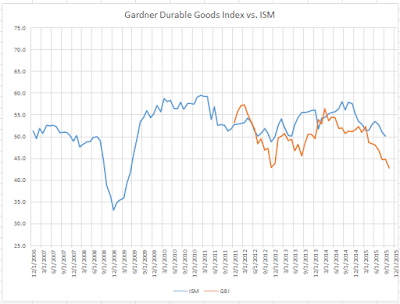 Note that the ISM correlates quite well with our index for companies with more than 250 employees. 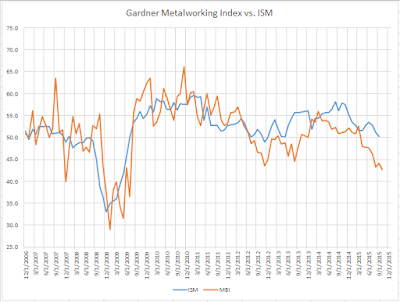 Also, the trend/pattern of the ISM correlates with our index for small companies, but the index level of the ISM is significantly higher. So, clearly the ISM focuses on larger companies. 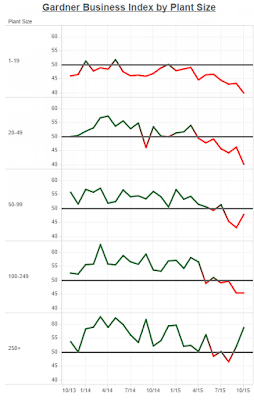 This gives the ISM a skewed perspective on what is happening throughout the entire manufacturing community, especially when roughly 30% of the manufacturing facilities in our database of more than 100,000 manufacturing facilities have fewer than 20 employees.